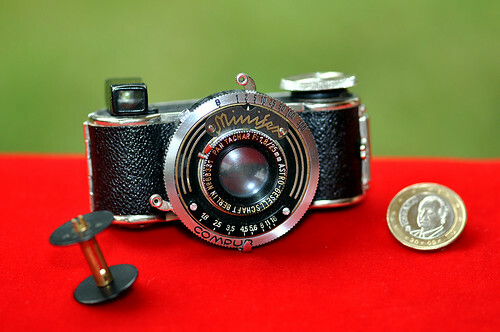 The Minifex was a German subminiature camera made in the 1930s by Fotofex, a company founded by Fritz Kaftanski. In July of 1934 Kaftanski founded the Minifex GmbH and transferred at least one patent right from Fotofex to Minifex. Maybe the extra company was founded for both, political and economical reasons. Kaftanski was an entrepreneur by heart and knew the economical advantages of what he did, but may have been under pressure to act so because of political reasons: 1934 the Nazis were in power, forcing Kaftanski to find ways to let his enterprises survive the anti-Jewish Nazi legislation. For his Sida cameras he did the same and founded a company with that name in Sept. 1934.. The Minifex camera had a very small body, with knob advance and rigid optical finder. It took 36 13x18mm pictures on special 16mm film (Mimosa film) with back paper. Strangely, the leaf shutter had a regular size, thus it was larger than the body. The film advance was supported by red window. The highlight of the Minifex's history is a 1933 model with Astro Berlin lens Tachon 25/0.95. This was the fastest camera lens, and the Mini-Fex was the smallest still camera for rollfilm, and of course both together a sensational product. So there were two Tachon versions, a regular one with a 25mm lens (produced), and a special one with a 52mm tele lens and focusing device (at least advertised). A motorised body with focal plane shutter was planned, nicknamed the Minifex MG. Corresponding patents can be found here, and more info here.